Irwandi Yusuf was a separatist rebel until the Tsunami hit in December 2004, taking 170,000 lives in Aceh ("Achay"), and shocking the two sides into seeking peace. Mr. Irwandi, now the elected governor, is still a rebel in that he is fighting corruption, something not many politicians in Indonesia bother to do. He is unpretentious, drives his own car, and gets along well with regular folks. The little green car accelerated around a mountain curve and flashed through a village here in Aceh Province, scattering chickens, children, dust and pebbles. It swerved past potholes, skidding precisely to the edge of the road before speeding ahead. At the wheel was Irwandi Yusuf, the new governor of Aceh, and he was racing into the hills to catch illegal loggers by surprise. Mr. Irwandi, 47, is a one-man political science experiment, a separatist rebel who has, quite unexpectedly, become the leader of the government he until recently had fought against. 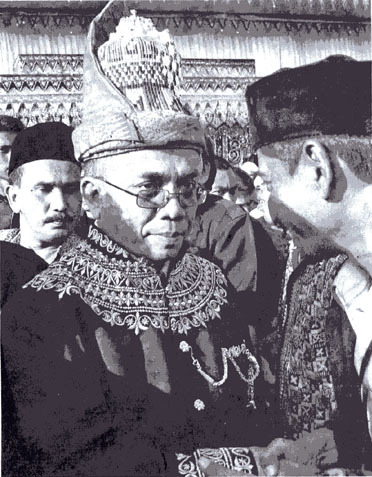 Under a peace agreement signed in 2005, Mr. Irwandi renounced his separatist agenda. He ran for governor last December and won, taking almost 40 percent of the vote in a field of eight. The second-place finisher was also a former member of the separatist movement, bringing its total to more than 50 percent of the votes cast. Mr. Irwandi took office at the start of February and is now guarded by the army that once hunted him in the jungle. He works with a police force that was known for its brutal treatment of his comrades. He travels to Jakarta to talk policy with President Susilo Bambang Yudhoyono, himself a former general. He has no alternative but to leave the past behind, he said. Most of the people he works with are his former enemies. Military intelligence still watches him, he said, as it did in the past, and he expects his most determined opponents to try to complicate his job with political manipulations. But the agreement that ended Aceh's 30-year separatist war, after the deaths of 15,000 people, is holding, and both sides seem to have embraced nonviolence. Mr. Irwandi has inherited a wounded province of four million people here on the northern tip of the island of Sumatra. The traumas of its long, brutal conflict have been compounded by the devastation of the Asian tsunami that took 170,000 lives in Aceh in December 2004. Along with economic revival he must deal with the reintegration of former rebel fighters, delicate relations with Jakarta, Islamist clerics and a local administration that is known for corruption and ineffectiveness. In a doubly unusual move for a new governor who is also a former rebel, he has decided to keep the old administration in place, cabinet ministers and all. If they are up to it, he said, they are welcome to ''rock and roll'' with him. AS he raced through the mountains, Mr. Irwandi talked, one after another, into three cellphones, dodging trucks and bicycles with one hand on the wheel. From the back seat, an aide handed him a Korean energy drink. He tipped his head back twice and drained the bottle. ''I'm not afraid of anything,'' he said, speaking of his adversaries, but sometimes driving straight toward oncoming traffic. Illegal logging, a major enterprise in Aceh, illustrates the problems he faces, and the way he means to take them on. He does have assistants. And as he careered through the mountains in his Toyota RAV4 sport utility vehicle, he was chased by three unmarked vans carrying what he said was his personal security team. When he reached the sawmills, after rocketing up a rutted forest road, the overseers were gone. It seems the bad guys may still have better intelligence than their new governor. But Mr. Irwandi insisted he had made his point. He took photographs of fresh-cut logs and heavy equipment that he said would be used as evidence when he made his move. ''I know I can't do it all,'' he said. But he seems to be trying. Mr. Irwandi said he had felt at home in his new job from the beginning. BY training, he is a veterinarian, with a degree from a local university where he later taught. He married a student there and they now have five children, aged 4 to 16. He joined the insurgency, the Free Aceh Movement, in 1990, but took a break three years later to study for a master's degree in veterinary science on a scholarship to Oregon State University. Back in Aceh he joined the movement's central command, where he served as chief spokesman and propagandist and helped reorganize its military structure. In 2003, Mr. Irwandi was arrested and sentenced to nine years in prison for rebellion, and he was there behind bars, 19 months later, when the tsunami struck. Mr. Irwandi climbed to the second floor. The walls around him were collapsing. ''I didn't know what to do,'' he said. He climbed to the ceiling, punched through a layer of asbestos and clambered onto the roof, where he rode out the waves. He was one of just 40 survivors from a prison population of 278. The trauma of the tsunami led the two weary armies to reach a peace agreement, signed in August 2005. Mr. Irwandi became the rebels' liaison with the international peacekeeping mission that, among other things, prepared the way for the election he won. As governor he works hard to stay ordinary, shunning an official mansion for a small rented house, where he receives a stream of visitors and petitioners. On the day after his raid on the loggers, Mr. Irwandi attended the inauguration of a soybean plantation here at Bireun, where he was born, about 85 miles southeast of the provincial capital, Banda Aceh. He was the only dignitary to arrive on time, and he sat patiently, cross-legged on a plastic mat, as, one after another, local officials with polished shoes arrived in convoys of polished black cars.